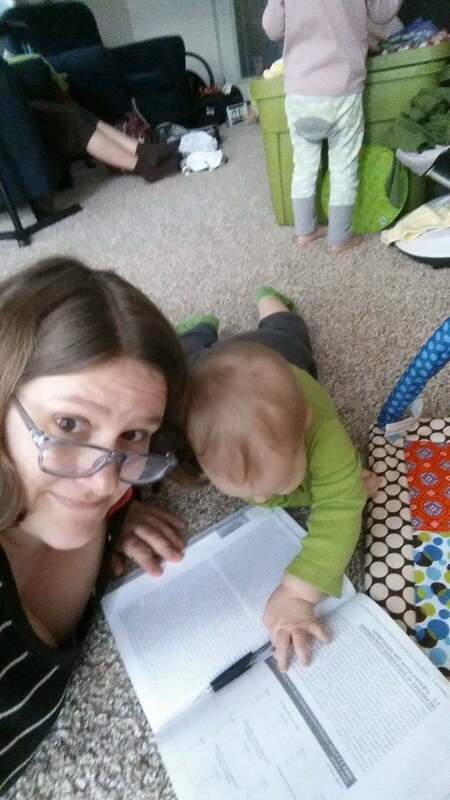 I’ve been really nostalgic for baby Darwin lately, and the differences between the two girls are increasingly apparent, so I decided this month I would look back to see what Darwin was up to at 8 months old and do a little comparison. Darwin’s 8 month update can be found here. It’s worth noting that no one in our household has had surgery lately. In fact, I think the biggest medical event in the past year was my experience giving birth to Linnea herself, so thank goodness for that. Sleeping. At 8 months, Darwin was still often not going to bed until after 9pm, and started consolidating naps to two a day- a midday nap and an afternoon one. Linnea’s sleep has been amazing at night: in bed and asleep by 8 or 8:30, often earlier, and few true wake-ups overnight. We bed share, so I don’t usually wake all the way when nursing her, and she doesn’t either. (An exception is when I rolled onto my back the other night so she couldn’t latch easily when she wanted to and I woke up to her patting me with one hand and signing “milk” with the other. Big smiles when I finally woke to let her nurse!). With all this said, naps are another story. She naps best either in a carrier or in the car (though she hates her car seat so car naps are almost always preceded by screaming. She sounds like an angry puma). Even these “best” naps usually top out at 45 minutes, and that’s assuming I’m able to keep her in the car or carrier that long. Since most places I drive are within 15 minutes of each other, this can be a problem. Rachel is sometimes able to get her to nap for 40-50 minutes at the child care swap while I’m in class, but it’s hit or miss. Nap times are also not highly structured. This is probably my fault, add I haven’t been able to give her a routine or regular nap times where I’m able to facilitate good sleep habits. I feel badly about this, but as a student parent without formal childcare, I’m pretty much at a loss regarding how to improve. I have been doing the vast majority of my work- homework, grading, corresponding with my advisor or professors, etc- after she’s in bed. Remember how I said she has few true wake ups overnight? That doesn’t account for the wake ups she has between her bedtime and my own. On good nights I’ll get an hour or two between wakings and on bad ones maybe just 30 minutes. It’s hard to predict and makes it hard to concentrate even on good nights since I’m hyper aware, expecting her to wake at any moment. My work has suffered quite a bit this term. Eating. It was actually really interesting to go back and read about how excited Darwin used to get about food. She has such strong feelings about which foods are acceptable and which aren’t that it’s hard to reconcile that with the baby who loved Indian food. It’s also helpful in reminding me that Linnea’s current enthusiasm aboutfood may not last. But for now, Linnea. Loves. Food. She puts away bananas like they’re going out of style. I keep buying baby food because it’s so portable but she does really well with many finger foods, too. She loves fruit of almost any kind. She’s less into beans than Darwin used to be, and olives (still one of D’s favorites) just don’t hold the same charm for her. But she put away half a pouch of red bell pepper/apple/beets which I don’t think Darwin would ever have touched. Current favorite foods are broccoli (steamed is preferable but raw will do), banana, and cheerios, though pretty much any fruit and most vegetables are greeted with delight. She is also a food thief, and will grab things off of plates or out of hands with no hesitation. Rachel lost two pizza crusts in about 10 minutes the other night, and Linnea took them both down ravenously. You’d think I never fed the kid. I haven’t weighed her since her last well baby visit about a month ago, but at that point she was 21 lbs and 27 1/2 inches. Clearly not actually starving. Moving. 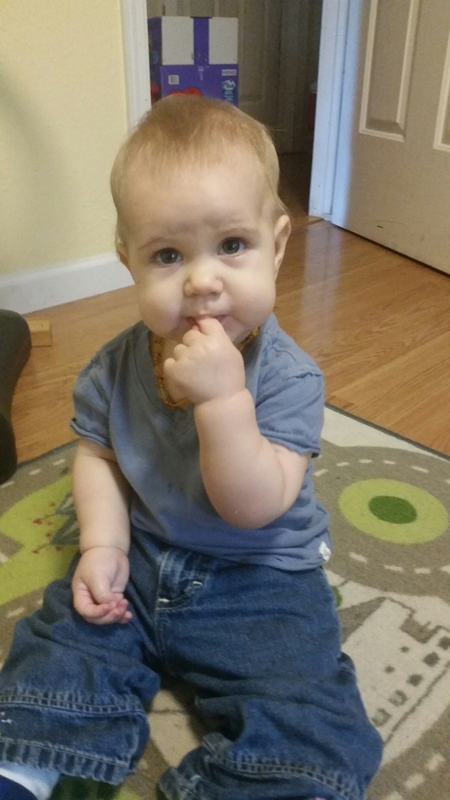 At this point, Darwin was just beginning to move from sitting to hands and knees, which is funny to think about now, with Linnea’s constant movement as a contrast. Linnea crawls everywhere (though she still does the “army crawl” on slippery floors sometimes) and is starting to try to pull herself up on things. She can’t get into her feet yet but gets onto her knees and will sometimes just sit there, seeing what it feels like to be a little taller. 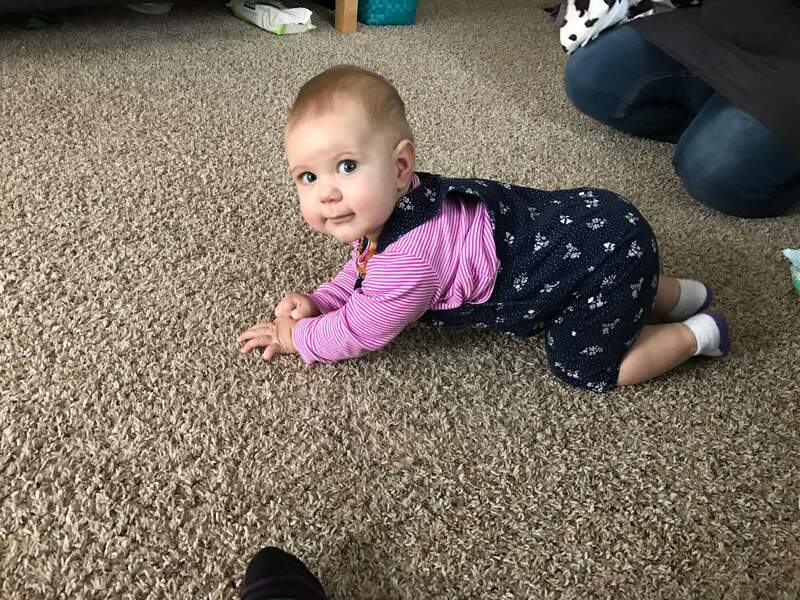 She goes easily from sitting to crawling and back. I have had to be more careful about where I leave her, as she has fallen off the bed twice with me just steps away. She’s a speedy little booger! The other day I was holding her up in a standing position and she took a full step (one foot then the other)! I wouldn’t say walking is imminent, by any means, but it was a striking reminder of how different the two girls are in this arena. Love this comparison! Our sleep issues sound the same as yours right now – we bed share and I barely wake for her nursing (but I can’t roll away onto my back either which gets me all stiff), and the tough part of nighttime sleep is between Avery’s bedtime and mine. I often end up laying next to her for a couple of hours because this time of night is so restless for her (that’s funny… that’s what I’m doing right now… Should be my school work time, but it’s my blogging-on-my-phone time). Haha yup, I wrote the post during Linnea’s nap instead of grading like I should have done!